Living in Canberra, I am lucky enough to be very close to the National Film and Sound Archive. One of the best parts about this cultural institution is the Arc Cinema (more details here), which showcases an incredible array of films. From ongoing exposure of films that only get tiny cinematic releases with the ‘Blink and you Miss Them’ series, through to Japanese silents and everything in between. Cynthia Piromalli, the Assistant Manager of the Arc Cinema Program, was kind enough to answer some questions for me, so check out the below interview, which I think is a pretty good read. Of course all opinions are Cyn’s alone and do not reflect the National Film and Sound Archive more broadly. Thanks so much to Cyn for doing the interview. I think there is some really fantastic insight here into both the history of cinema and its future too. Q: Your job title is … Could you give us an insight into a typical day at work for you? In my head, you probably go in to the archives, watch some old movies, maybe organise a dream program, and then watch some more old movies. But I am guessing I am a little way off. I’m Assistant Manager of the Arc Cinema Program, which runs at the National Film and Sound Archive’s HQ in Canberra. There’s only two of us programming the cinema, so a typical day for me is quite simply madness. There are so many elements to administering the program (as well as programming it) and will generally involve anything from sourcing films and their prints and fees from distributors and private collectors over the world, doing financials, reporting statistics (as we are part of a Government organisation this is an integral part of the job), social media marketing, strategic and operational meetings, working on partnerships (we have long running ones with the US Embassy and the Canberra Film Festival, and lots more short term ones), answering lots of emails, writing calendar notes, scheduling … Sadly we don’t get to sit down and watch a lot of films during the day, so you can very often take the job home with you. Q: What was your path into this particular role? I.e. uni, other work experience etc. I was already working at the NFSA when the cinema opened, and was administering the branch that the cinema was in, so it was an easy transition from one job to the other. Like many programmers, it just happens because of other skills you have (research and the like) and of course your interest in cinema. Q: Why do you think it is important for institutions such as the NFSA to be maintained? And what, if anything, separates the importance of film preservation from the preservation of art and literature, as is achieved by other national, cultural institutions? From the point of view of an exhibitor, the decline of the use of 35mm film in production is the example I’ll use: the recent introduction of DCP (digital cinema) has been embraced by both filmmakers and commercial exhibitors alike (including us, we had a 4K projector installed in July 2012). However it does create a problem for cinemas like ours: now when classic films are restored, they’re generally only re-released on DCP, and the film prints are getting destroyed as part of that process. However, 35mm film projection is still of great importance to archival and retrospective cinemas and, let’s face it, we already know it lasts 100 years. Because of the cost of storing the prints, distributors and filmmakers are happy to destroy them and move to digital cinema instead, but archives like ourselves are very happy to take them. It’s extra insurance in case files are corrupted or destroyed. We hope that this message reaches a lot of the industry – we are here to archive and preserve, in any format, but film is such an integral part of our cinema history. And it’s such a beautiful format to watch. Appreciation for it – on a global scale – will return, I have no doubt of that (such as the popular re-emergence of vinyl in recent years, and thank heavens for that). That’s when the collections of archives will be truly appreciated. Arc Cinema – using these resources already – already appreciate it. As far as our importance compared to other cultural institutions: I won’t say we’re more important, but we would like to be on the same level, certainly. Audiovisual archiving doesn’t seem to have the exposure of other collecting institutions, and yet the history we hold is just as relevant. Arc Cinema is like an art gallery – we’re there to show off our collection and the collections of other archives around the world. It’s just a different format, a different way of viewing culture and history. Q: What is the one thing at the Archives that people should make the time to see? Everything! It’s not a huge building, so you can really take your time in our gallery. At the moment we have Goyte’s Fractured Heart as part of our exhibition, which has been very popular and very exciting for us. And of course our gorgeous cinema, both indoors and outdoors. Q: Do you have a particular cinematic passion, i.e. Australian film, or French film, or do you have a broader interest in anything on the big screen? Disaster films. There, I said it. I’m also documentary person. Particularly contemporary documentaries because they really have refined the art of making a great doco: not just information, but multi-layered opinion. I especially love the ones that make me angry, because I know its done its job. Q: Is there a particular Arc screening you are most proud of? John Carpenter’s They Live. I wasn’t sure if anyone was going to come and see it – it was part of an overall Carpenter retrospective which included films like Halloween and The Thing which you already know people are going to come and see. But, for me, They Live encompasses so much of Carpenter as a filmmaker, and what he was trying to convey to the world through his art form. We had nearly 80 people there. It was my best day of 2011. But in reality, we’re proud of all of them. They take so much work to get from our brains to the screen, and each one is an achievement. We’re not picking DVDs off a shelf, or signing up to 3 months of the latest blockbuster. It takes a lot of persistence to find the titles we put on, and each one is something to be proud of. Q: Is there a dream film or program of films you would love to put on at Arc, but have not gotten the chance as yet? Done and done, good sir, with the Carpenter films. I would also love to do a Cyborg series, to compare how different filmmaking cultures conceive the future via artificial intelligence (not to mention the various FX seeing as most of these films were made in the 80s). I wanted to do an homage to Stan Winston, but I think the time may have come and gone for that, we’ll see. Q: I noticed that there is a fantastic line-up of Universal Monster films coming up soon at Arc. Could you tell us a little about the program, and perhaps why you think these films have managed to transcend their ‘B-movie’ origins, to become classics? Sadly I was too swamped to return your questions in time, so that part of the series has passed. However we are continuing our series of Universal Films into 2013 to celebrate their 100th birthday. Early in the year we’ll be looking at the noir films, which is another fascinating part of their history. Retrospectively discussing the monster films, at the time of their release they were incredibly artful and showed great bounds in special effects. In some ways, they were the Terminator 2 and Avatar of their day – with new filmmaking and special effects methods being created to bring these stories to the big screen. Knowing those back stories (which is part of our aim at Arc Cinema, to give the audience context to each film) you can appreciate them for what they were then, rather than comparing them against the special effects of today. Either that, or the B-Grade has gone down a lot since then! Q: Do you have a favourite old school monster flick (can be one that is not showing)? You can’t go past the classic Godzilla films. And I still prefer the King Kong of the 30s than any of the ones that came after it. I do love a bit of stop-motion! Q: Do you frequent mainstream cinemas outside of Arc? If so, what are your favourite kind of films to see? I don’t get to commercial cinemas a lot, so if I do go, it’s to something I really want to spend the money on and see. I love escapism, so my taste is very mainstream when I’m watching movies in my spare time (I get exposure to very broad genres at work, so going to a cinema socially must involve intellectual chocolate). I was a child of the 80s, so anything with explosions will do me just fine. And where the good guy wins, because that very rarely happens in real life (and European cinema). Q: Have you seen anything recently that you loved? 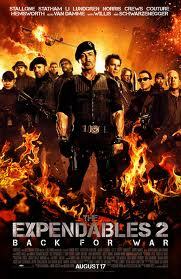 Expendables 2 was the movie of 2012. I’ll stand by that. Q: Outside of cinema, do you have any other passions? There is life outside of cinema? 😉 I have two brilliant kids who are also movie-mad, so our lives revolve around movies. And Mario Kart. And op-shopping. James Bond or Jason Bourne? Bond. But only if it’s George Lazenby. Terrence Malick: Utter genius or utter wanker? Hahahaha – well, that could very well depend on your mood and how many grains of salt you have on you at any one time. Buster Keaton or Charlie Chaplin? Favourite film of all time? Predator. It’s a rich tapestry, really it is. Favourite director of all time? Like what you read? Then please like Not Now I’m Drinking a Beer and Watching a Movie on facebook here and of course check out the National Film and Sound Archive Website. For sure, it is a very cool place. Heading there Thursday after work actually. Tickets are like $5 from NZ yeah (you are in NZ aren’t you)? If so, then deal. Sorry dude, no can do then. Though I will shout you a ticket if you get the flight. Yeah they do an incredible job. I am seeing Compliance Thursday which received no other theatrical release in Canberra, and I’m not sure if it got a release anywhere out here. Great interview! Sounds like such a cool (if rather manic) job. I would spend so much of my time in there, I really wish there was something like that near me. Cool and manic it would be. The (government funded) cultural institutions have faced really tough budgetary environments over the last few years. So they are still delivering all the same awesomeness, with limited staff and overall budgets. The NFSA as a whole is great, as is the Arc cinema part of it. And it is awesome cause they don’t just focus on old films, but also newer ones that either received a tiny cinematic release or none at all. Saw Compliance tonight, and am catching 3 more 2012 films there over the next three weeks that received no real cinema release (and also the Kirk Douglas starring version of 20,000 Leagues under the sea which I am psyched for). Very jealous of you having such an amazing place on your doorstep! I’ve always said that if I won the lottery I would try and open a place just like that. We haven;t had Compliance yet here and not sure if it’ll ever make it into cinemas to be honest, but it looks really interesting.